a. ^ Danish monarchy reached Greenland in 1380 with the reign of Olav IV in Norway. b. 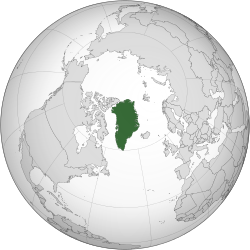 ^ Greenland, the Faeroes and Iceland were formally Norwegian possessions until 1814 despite 400 years of Danish monarchy beforehand. c. ^= As of 2000: 410,449 km² (158,433 sq. miles) ice-free; 1,755,637 km² (677,676 sq. miles) ice-covered. Density: 0.14 /km² (0.36 /sq. mi) for ice-free areas. Эн халхин отхн сольсн: 21:31, 14 Ноха сарин 2017.